aggravating equity or mitigating disadvantage? Low-fee private schooling represents a point of heated debate in the international policy context of Education for All and the Millennium Development Goals. While on the one hand there is an increased push for free and universal access with assumed State responsibility, reports on the mushrooming of private schools targeting socially and economically disadvantaged groups in a range of developing countries, particularly across Africa and Asia, have emerged over the last decade. Low-fee private schooling has, thus, become a provocative and illuminating area of research and policy interest on the impacts of privatisation and its different forms in developing countries. This edited volume aims to add to the growing literature on low-fee private schooling by presenting seven studies in five countries (Ghana, India, Kenya, Nigeria and Pakistan), and is bookended by chapters analysing some of the evidence and debates on the topic thus far. The book presents research findings from studies across three levels of analysis that have proven relevant in the study of low-fee private schooling: the household, school and state. Chapters address household schooling choice behaviours regarding low-fee private and competing sectors; the management, operation and relative quality of low-fee private schools; and changes to the regulatory frameworks governing low-fee private schools, and the impact of low-fee private schools on those frameworks. The book does not seek to provide definitive answers since, as an emerging and evolving area of study, this would be premature. Instead, it aims to call attention to the need for further systematic research on low-fee private schooling, and to open up the debate by presenting studies that use a range of methods and, owing to the context specificity of the issue, draw different conclusions. The hope is that these studies may serve as springboards to further research. Finally, the book does not aim to snuff out the political and vociferous debate surrounding low-fee private schooling and private provision more broadly, or to erase the complications that abound in conducting research in this area, but to engage with them. 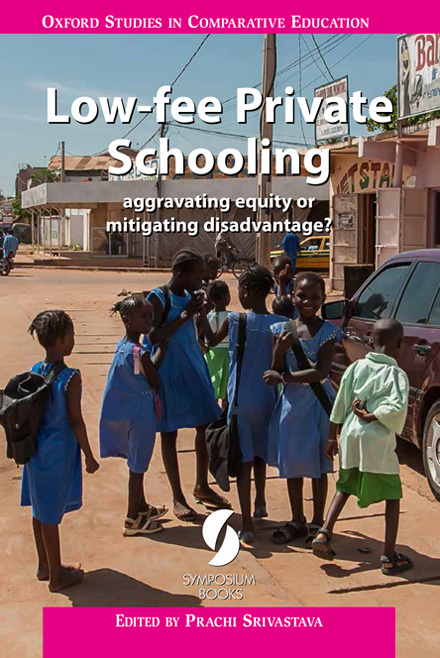 The hope is that as the 2015 target date for Education for All and Millennium Development Goals approaches, this book may help us get closer to answering the question: do low-fee private schools aggravate equity or mitigate disadvantage? Kwame Akyeampong & Caine Rolleston. Low-fee Private Schooling in Ghana: is growing demand improving equitable and affordable access for the poor? Shailaja Fennell. Low-fee Private Schools in Pakistan: a blessing or a bane? Folasade Adefisayo is Director, Corona Secondary School, Lagos, Nigeria, the only secondary school in the group of schools owned by the Corona Schools Trust Council. Prior to this appointment, Ms Adefisayo was Executive Director of the Corona Schools Trust Council, a position from which she retired after eight years. A committed educationist, she has also been involved in research and education reforms and, for over six years, was consultant to the Education Policy Group of the Nigerian Economic Summit Group (NESG), a private sector public sector think tank. In 2008, Ms Adefisayo was commissioned by the World Bank to conduct a survey of private secondary schools in Lagos State. A seminal experience, this led to another survey, this time on private primary schools in Lagos State commissioned by DFID. Ms Adefisayo holds an MBA and, before becoming an educationist, was a banker for over 16 years. Kwame Akyeampong is Reader, Sussex School of Education and Social Work, University of Sussex, UK, and as of 2012, Senior Policy Analyst, Education for All Global Monitoring Report Team, UNESCO, Paris, France. From 2010 2012 he was Director, Centre for International Education, University of Sussex. Dr Akyeampong’s research interests include teacher education policy and practice, access and quality issues in basic education, and education system and programme evaluation in low-income countries, and he has conducted research on teacher education in sub-Saharan Africa, education access, and decentralisation with a special focus on Ghana, Kenya, and Rwanda. He has published widely on the topics, and co-edited a special issue on ‘Educational Access in Sub-Sahara Africa’ for the journal Comparative Education (2009). His most recent research is an impact evaluation of the ‘Speed School’ accelerated learning programme for school dropouts in Ethiopia. Roger Cunningham is Senior Education Adviser with Cambridge Education, Cambridge, UK. He was formerly Senior Education Adviser with the UK Department for International Development (DFID) (1997 2010). In the latter capacity he worked in Pakistan (2008 2010), India (2002 2005), and the Caribbean (1997 2002), and was on secondment to the European Union (2005 2008) as Regional Education Adviser to Southern Africa. In a career spanning work in over 25 countries, he has also worked for non-government organisations, the British Council, and private-sector companies. His experience ranges across a number of areas in education and development, including education policy and strategic planning, aid programme design and management, and monitoring and evaluation. He is also a qualified primary teacher, and has worked in both public and private schools. Pauline Dixon is Senior Lecturer in Development and Education, Newcastle University, UK, where she gained her PhD in 2003. For the last ten years her research has focused specifically on private and government schools that cater for low-income families living in the slums of Asia and Africa. Her work is published widely in books and academic journals, including School Effectiveness and School Improvement. She is currently acting as a consultant for the London-based charity Absolute Return for Kids (ARK), and is working with their team in Delhi to provide a framework and working model for a targeted education voucher scheme. Her doctoral research considered the regulations that private unaided schools in India had to abide by in order to gain recognition, from an Austrian economic perspective. She is author of International Aid and Private Schools for the Poor: smiles, miracles and markets (Edward Elgar, 2013). Shailaja Fennell is a university lecturer in Development Studies, a Fellow, Jesus College, University of Cambridge, UK, and Director of Research, Cambridge Central Asia Forum. Dr Fennell was an international team leader on the project on public private partnerships in education for the DFID-funded Research Consortium on Educational Outcomes and Poverty (RECOUP). She was a member of the team commissioned by the EU to bring about the first European Report on Development (2008 2009), Overcoming Fragility in Africa: forging a new approach forward. Dr Fennell has been appointed Visiting Professor at the Kazakh National University in Almaty (2008), and had a professorship conferred by the Kazakh-Turk University (2009). She holds BA, MA and MPhil degrees in Economics from the University of Delhi, and MPhil and PhD degrees from the University of Cambridge. Joanna Härmä is Research Officer, Education for All Global Monitoring Report Team based in UNESCO, Paris, France, and Research Associate with the DFID-funded Consortium on Educational Access, Transitions and Equity (CREATE), University of Sussex, UK. Until October 2011, she was the private education specialist for the DFID-funded Education Sector Support Programme in Nigeria (ESSPIN), and had worked on the education management information system for three of ESSPIN’s six states since April 2009. Before this, she was Visiting Scholar at Columbia University from 2008 to 2009, based in the National Center for the Study of Privatization in Education. She earned her doctorate at the Centre for International Education, University of Sussex. Her thesis investigated the school choice decisions of parents in remote rural Uttar Pradesh, India. She has authored several papers on the topic. While working for an anti-child-labour NGO, she started a girls’ school with her husband in the same part of Uttar Pradesh. The school is funded through charitable contributions, and continues to thrive. Dr Härmä’s writing is unconnected to her current work at UNESCO. Stephen Heyneman is Professor of International Educational Policy, Vanderbilt University, USA, where he has been since 2000. He spent 22 years working on education at the World Bank. He received his PhD in Comparative Education at the University of Chicago. Salman Humayun is Executive Director, Institute of Social and Policy Sciences (I-SAPS), Islamabad, Pakistan, and previously worked with the Education Sector Reforms Assistance (ESRA) Programme in Pakistan. He has substantial experience in the areas of strengthening policy and planning capacities of the Federal and Provincial Ministries of Education in Pakistan, and improving education governance through increased use of evidence-based decision making at national, provincial and district levels. Dr Humayun’s range of experience spans public policy, public finance and governance reform, particularly with respect to sector financing and decentralisation and accountability mechanisms. Yuki Ohara has been awarded a Japan Society for the Promotion of Science (JSPS) Postdoctoral Research Fellowship, Graduate School of Asia-Pacific Studies, Waseda University, Tokyo, Japan (2011~). She was previously awarded a JSPS doctoral research fellowship, which she held at the Department of Education, Kyoto University (2008 2010), and was also a research intern at the National University of Educational Planning and Administration (NUEPA), New Delhi (2008 2009). She completed her doctoral thesis on low-fee private schooling in India based on fieldwork conducted in Delhi, and recently obtained her PhD from the Department of Education, Kyoto University, Japan. Her work on low-fee private schools has been published in several Japanese journals, including Comparative Education, South Asian Studies and Educational System and Organization, and in the British Association for International and Comparative Education’s journal, Compare (2012). Caine Rolleston is Education Research Officer for Young Lives, Department of International Development, University of Oxford, UK. Previously, he worked as a researcher for the Consortium on Educational Access, Transitions and Equity (CREATE), University of Sussex, while conducting doctoral research at the Institute of Education, University of London, focused on issues of access to and the economic benefits of education in sub-Saharan Africa. Dr Rolleston’s background is in economics and education, but he has experience working across a variety of disciplinary approaches, and on issues of education access and poverty reduction. This includes research on the growth of the low-fee private sector in Ghana and Nigeria, as part of the Soros Open Society Institute Privatisation in Education Research Initiative (PERI), and on financing the education MDGs for UNESCO’s Education for All Global Monitoring Report. Ian Schagen is currently working as a freelance analyst with particular interests in education in developing countries. He was, for many years, Head of the Statistics Research and Analysis Group at the National Foundation for Educational Research (NFER), leading the largest group of statisticians in the UK on education research. His particular interests are on value-added analysis and multilevel modelling. Following his retirement in April 2008, he worked for a year with the Research Division of the Ministry of Education of New Zealand as Chief Research Analyst. He is the author of numerous academic papers and technical reports, and the co-editor of But What Does It Mean? The use of effect sizes in educational research (2004). Rizwana Shahzad is Research Fellow, Institute of Social and Policy Sciences (I-SAPS), Islamabad, Pakistan, where she has been conducting various studies and assessments on education financing, governance, and service delivery systems. Ms Shahzad holds a master’s degree in Social Sciences from the Quaid-i-Azam University, Islamabad. Prachi Srivastava is Associate Professor, School of International Development and Global Studies, University of Ottawa, Canada. Her research interests include the privatisation of education and private schooling in developing countries, in particular low-fee private schooling; non-state and private actors in international education and development; and global education policy and the right to education. She has been working on low-fee private schooling with a focus on India for more than a decade. She has published widely on the topics. Her works have appeared in Compare, Development, Development in Practice, the International Journal of Educational Development, among others. She co-edited Private Schooling in Less Economically Developed Countries: Asian and African perspectives (2007, with Geoffrey Walford). Dr Srivastava has recently been awarded a major grant as Principal Investigator by the Social Sciences and Humanities Research Council (SSHRC) of Canada to investigate the emergence of new non-state private actors in education and the right to education, and has recently completed a project (with CORD) on the early implementation of India’s Right to Education Act and the role of the private sector in Delhi, funded by the Soros Open Society Institute’s Privatisation in Education Research Initiative (PERI). She earned her doctorate from the University of Oxford. Jonathan Stern is a doctoral student in International Education Policy and Management at Vanderbilt University, USA. He is a participant in the Experimental Education Research Training (ExpERT) program sponsored by the US Department of Education. He is also a sponsored Fellow of the Institute of Education Sciences, and recipient of a Peabody Graduate Honor Scholarship. James Tooley is Professor of Education Policy, Newcastle University, UK. He has been working in the field of low-cost private schools in Asia and Africa for over a decade. His book documenting this work, The Beautiful Tree (2009), won the 2010 Sir Antony Fisher Memorial Prize. He was founding president of the education fund Orient Global, and lived in Hyderabad, India for two years, where he created a chain of low-cost private schools. Since then he has helped set up educational companies in China and Ghana, with a further company in India. Geoffrey Walford is Emeritus Professor of Education Policy and Emeritus Fellow of Green Templeton College, University of Oxford, UK. He was joint editor of the British Journal of Educational Studies (1999 to 2002), and editor of the Oxford Review of Education (2004 to 2010). His books include: Privatization and Privilege in Education (1990); Choice and Equity in Education (1994); Policy, Politics and Education: sponsored grant-maintained schools and religious diversity (2000); Private Education: tradition and continuity (2005); and Markets and Equity in Education (2006). He has also edited many books, including: Private Schools in Ten Countries: policy and practice (1989); Private Schooling: tradition, change and diversity (1991); The Private Schooling of Girls: past and present (1993); Private Schooling in Less Economically Developed Countries: Asian and African perspectives (2007, with Prachi Srivastava); and Blair’s Educational Legacy? (2010).